On Friday, an hilarious installment of The New York Diet went up on New York Magazine's Grub Street blog written by none other than my boss — yes, I do have a day job (that I love) — that slapped me with an important though unintentional reminder: It's so lovely and wonderful to eat with the seasons, strawberries and rhubarb go incredibly well together, and both strawberries and rhubarb are in their prime season right now. 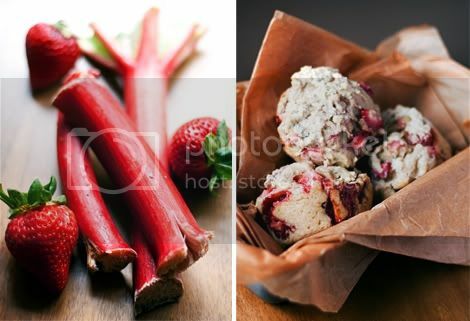 What to do with strawberries and rhubarb? Well, there's always pie. Or crumble. 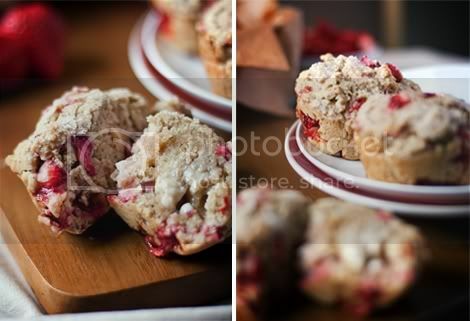 But another quick and easy marriage of the two seasonal sweet-and-tart ingreeds is the less-mentioned Strawberry Rhubarb Muffin. For me, muffins that are sort of coffee cake-y are the total best, and ten times faster and easier to whip up than an actual coffee cake. That's what these muffins are — a simple way to add a sweet treat to your morning meal. A side note: I've Veganized these muffins, and I think that those of you who are lacto-ovo veggies and vegan-curious omnivores will like them just as they are — totally pure veg (vegan). Another side note: I've only made this recipe once and would love to play around more with getting an even lighter texture. If you make them at home, feel free to experiment if you're keen and let me know what changes, if any, you've made. A big part of Veganizing baked goods is experimentation and I love sharing tips and ideas back-and-forth with you guys! To Start: Preheat oven to 400°F. Grease muffin tins with nonstick cooking spray or line with cupcake liners; set aside. In a small bowl, whisk together the non-dairy milk and vinegar, and set aside to curdle (this is a replacer for buttermilk). Prepare the batter: In a medium bowl, add the non-dairy milk and vinegar mixture, sugars, oil and vanilla. Whisk together until well combined. In another bowl, mix together the flour, baking powder, baking soda, cinnamon, cardamom and salt. 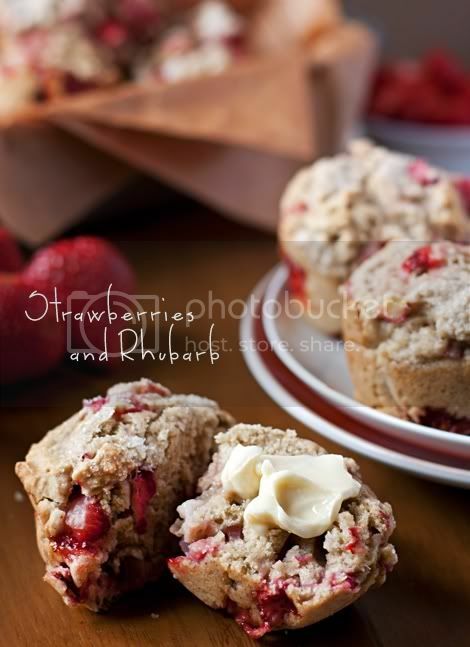 Mix the rhubarb and strawberries into this dry mixture, carefully tossing to coat with a dusting of the flour mixture to keep the fruit from sinking to the bottom of the muffins. Bake the muffins: Distribute the batter evenly into the muffin tins and top them with a few sprinkles of white sanding sugar. Bake for 20-25 minutes (depending on the size of muffin pan you use), until a toothpick comes out clean. Let muffins cool in the pan for about 10 minutes, then flip the pan over and carefully let the muffins fall out. Turn the muffins over and allow them to finish cooling on a wire rack. Serve with a pat of Earth Balance Natural Buttery Spread, or enjoy right off the rack! I made these last night with a few recipe adjustments. I used applesauce instead of oil and didn't put in the apple cider vinegar. They are delicious. I made these for a group of women and children and we all enjoyed them so much! Thank you!!! PS: This website is beautiful! I enjoy your photography a lot! I'm making these again! I got more rhubarb from my CSA yesterday! YAY for yumminess!